I apologize in advance for this hit & run project, but there was no way that my cat Gizmo was going to let me get a tutorial posted today*. I barely got a picture of the little reindeer before Gizmo pushed me out of the way. I guess I was squealing too much at the reindeer, and Gizmo got jealous. Silly cat, it's only paper. *If you can get going with just some of the measurements, take a peek at THIS PDF and you can at least get the instructions for how to make the box, how to score the Top Note, and how to do the basic box and head assembly. If you see something go on sale on Tuesday, you head over to my ONLINE STORE to purchase it as soon as you can to have the best chance of getting it at the sale price. You may want to Subscribe to My Blog by Email to ensure you know which items are on sale, as soon as possible each week! NOTE: the deadline to have your order finalized for each set of Weekly Deals is 11:50pm MT each Monday night. CLICK IMAGE TO SHOP WITH ME NOW!!! 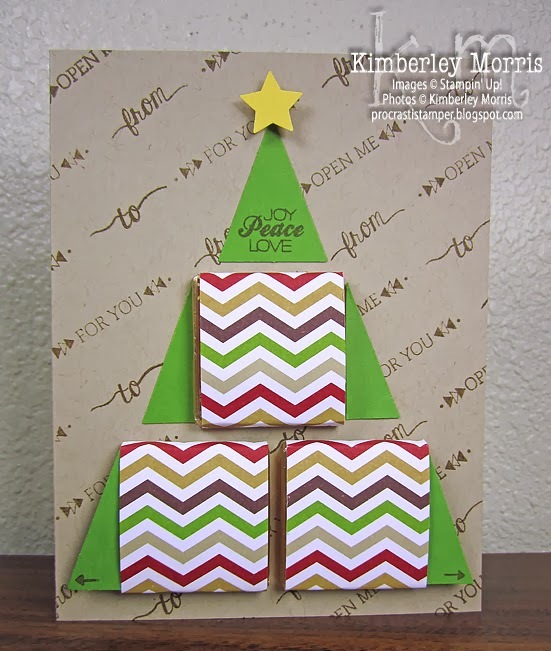 Yesterday I shared a tutorial for a bow I put on my Divine™ Chocolate Gift Box Card. Today I want to show you my Divine Chocolate Christmas Tree Card, as the second in my series of cards, which deliver treats along with their holiday greetings! Like the Gift Box Card, this card features Divine Milk Chocolate Mini Pieces which can be pulled out of the little sleeve wraps on the front of the card, so the chocolates can be enjoyed without ripping the card to shreds! The top chocolate is accessible from both sides, so it doesn't need a pull tab. Also, like the Gift Box Card, this card features the Christmas Tagables stamp set, which you can read all about and order HERE. I used Soft Suede ink, because that is what you will get if you order the Christmas Tagables stamp set in the discounted Pop & Place Holiday Gift Tag Starter Bundle. The background of the card is actually the same string of stamps I mounted in a single line on Clear Block I and used for the Gift Box Card background. And I also made sure to use a foundation for the card that you can order already cut and scored: Crumb Cake Cut & Ready Card Bases. I'll tell you what...if you buy your supplies from me through November 29th, you can enter to Win $50 in FREE Product of your Choice in my 25 for $50 Contest. 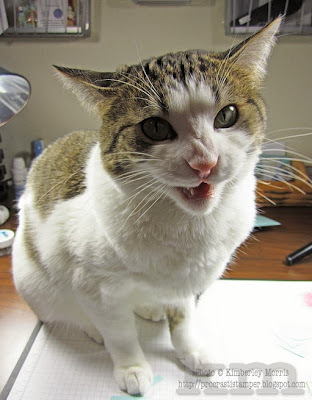 PLUS, 10% of your Purchase Price is Donated (excluding shipping & tax) to help a sweet kitty named Scooter. BUT WAIT, THERE'S MORE! You Save Up to 50% OFF when you shop Stampin' Up! 's 2013 Holiday Sale, and if digital designing is your thing, you can grab select downloads on the cheap when you shop our 30% OFF Digital Holiday Sale! And this is my horrific distraction. Doesn't she look menacing?!? She is not really being mean at all, I just caught her in the middle of a strange pleading noise she was making. She did not want to leave me alone, she's standing right on the pieces of the bow I was trying to make and photograph. I don't know if it's the changing weather, or what, but both my kitties are being total attention whores lately. *sigh* At least they are healthy, and I'm thankful for that. Super Savings Help You Support SCOOTER! When you shop with me through November 30th, 10% of your retail purchases (before tax or shipping) will go to help Scooter. Just email me after you place your order in my Online Store and let me know your purchase was for Scooter's benefit! Scooter is a sweet little furbaby who lives with his human Mama (and Not-da-Mama), and several other special kitties. Scooter has Spina Bifida, and his back end doesn't work at all. You can read more about Scooter and the other special kitties here on The Geminites Facebook Page. I am also running a personal special through November 29th, called the 25 for $50 Contest. All you need to do is enter the Hostess Code U77RZFNB in the appropriate field near the bottom left of your Shopping Bag in my ONLINE STORE, and you will get an entry for every $50 in merchandise you purchase. The winner gets $50 in FREE product of his/her choice!!! So, you want to help Scooter but don't want to purchase paper crafting supplies? 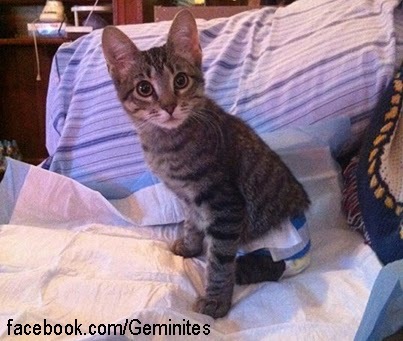 Go LIKE The Geminites Facebook Page and you can then find information about how you can send in your donation by participating in their Holiday Card Exchange, or donate directly to them via PayPal. You may also choose to purchase from Gold Orchid Publishing, as they are hosting Scooter Month during November--you can find out more on the Gold Orchid Publishing Facebook Page. 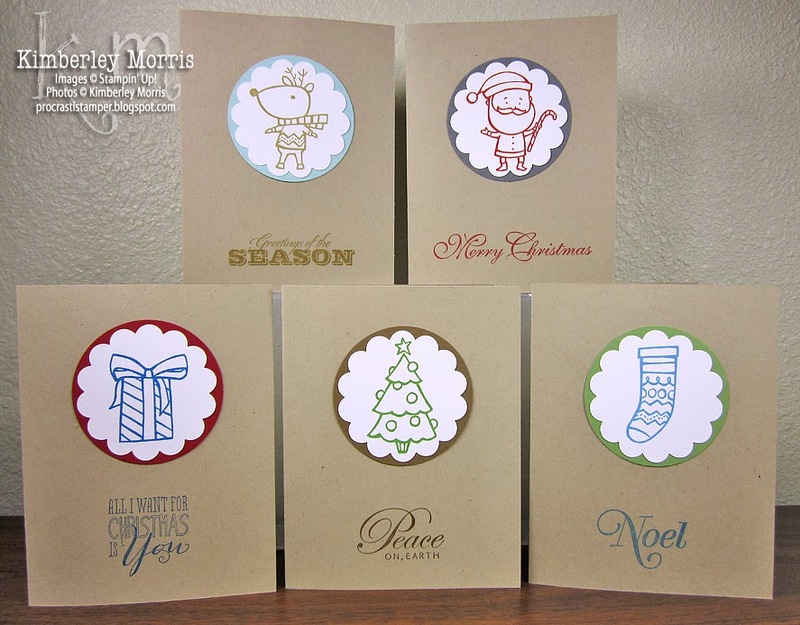 The main images on each of these 5 cards, all come from one stamp set called Color Me Christmas (available in wood-mount or clear-mount). I stamped them each with different colors of ink because I wanted them to be different without coloring them. But honestly, you could stamp all the pictures onto Whisper White card stock using StazOn Jet Black ink and then color in the pictures with markers...or pass the work onto the kiddos with a set of crayons! That is, after all, why the set is called Color Me Christmas. To keep the supplies to a minimum, just use the same StazOn Jet Black ink to stamp the seasonal sayings, too. I used all 4 greetings from the Greetings of the Season stamp set (available in wood-mount or clear-mount), and added the "all I want for Christmas" saying from the Christmas Messages stamp set (available in wood-mount or clear-mount). FYI: the clear-mount version of the Christmas Messages set is 30% OFF during the 2013 Holiday Sale from Nov 20th thru December 2nd, 2013!!! But you could just use either one stamp set or the other, if you'd prefer. The only other things you might need to know are that the background circle of card stock is cut with the 2-1/2" Circle Punch, and the images were punched out with the 2-3/8" Scallop Circle Punch. Again, if you want to keep the supplies to a minimum, just choose one color card stock for the 2-1/2" Circle Punch instead of the varied colors that I used. I recommend Soft Suede card stock for that option, because it's dark enough to give you deep contrast, yet neutral enough to go with any other colors you put on the card. Reindeer - Baked Brown Sugar ink for Reindeer and saying, Pool Party card stock for background circle. Santa - Real Red ink for Santa and saying, Basic Gray card stock for background circle. Gift - Pacific Point ink for Gift and saying, Cherry Cobbler card stock for background circle. Tree - Gumball Green ink for Tree, Soft Suede ink for saying, Soft Suede card stock for circle. Stocking - Marina Mist ink for Stocking and saying, Wild Wasabi* card stock for circle. *Gumball Green will almost work for this but I felt it was just a tiny bit too bright, and competed with the Marina Mist stamping. Stampin' Up! 2013 Holiday Sale (Nov 20-Dec 2) - up to 50% OFF! Click Image to Shop the Holiday Sale with ME! Click HERE to SHOP the Holiday Sale with ME! Use Hostess Code U77RZFNB to enter my 25 for $50 Contest!!! I *HIGHLY* recommend the Stampin' Trimmer, even if you already have a trimmer (or 2 or 3), this beauty beats them all. I did not need to change my blade for a very long time, but you might want to grab some Refill Cutting Blades to keep on the shelf. Need more info before you buy? Check out this Stampin' Trimmer YouTube Video: http://youtu.be/9BPZd6PZN0Y. If you like the Simply Scored Scoring Tool, you'll want to grab the Simply Scored Diagonal Plate on sale as an add-on (it is not intended for use separately). Yes, we have the Envelope Punch Board now, but you can't score across an entire sheet of 12"x12" paper on that, like you can with the Diagonal Plate of the Simply Scored Scoring Tool. If you want to see more, just check out this Simply Scored Diagonal Plate YouTube Video: http://youtu.be/vkNFzMa1azw. And if you want to have all Stampin' Up! 's core ink colors at your fingertips, you definitely NEED the Many Marvelous Markers--38 dual-tipped markers for not much more than $2 each, in one spectacular carrying/storage case! The case actually has 48 slots in it, so you can add our 10 current In Color markers to it. Here are links to our 2012-2014 In Color Marker Assortment, and our 2013-2015 In Color Marker Assortment, just in case you want to add those to your order. If you aren't sure why you might like to have the Many Marvelous Markers, you can check out a few of the possibilities that open up to you, in this Markering YouTube Video: http://youtu.be/YcY8iH14eEE. The best place to view images and descriptions of all these items is in my ONLINE STORE. I plan to highlight several particular items throughout the sale for you--and tell you what's on my MUST HAVE list. However, at any time during the Holiday Sale, you should be able to click the Home category in the left sidebar of my ONLINE STORE to see an image which will take you to all the sale items. If not, check that left sidebar for the Holiday Sale category, and click that. If you have any questions or experience any problems, please feel free to Leave a Comment or email me. If you see something go on sale on Tuesday, you head over to my ONLINE STORE to purchase it as soon as you can to have the best chance of getting it without having to wait for any backorders! You may want to Subscribe to My Blog by Email to ensure you know which items are on sale, as soon as possible each week! NOTE: the deadline to have your order finalized for each set of Weekly Deals is 11:50pm MT each Monday night. *You will need to grab a copy of My Digital Studio for these digital classes, if you don't already have it. You can download a free trial version of My Digital Studio, but the full My Digital Studio program is only $19.95 to purchase, with no shipping charges for the download version, and you get a lifetime license--no monthly or annual costs, no online access needed to use the program or the art because it all installs directly to your computer. Ready to get started with My Digital Studio NOW?? I've had this idea on the back burner for weeks, and I think I'll just go ahead and share the card with you. This card holds 4 Divine Milk Chocolate Mini Pieces on the front. Each chocolate has its own pull tab, so you can pull it out for nomming, and the patterned paper squares on the front of the card stay in place. So, the recipient can enjoy the chocolate without tearing up the card :-) I'm happy to make a tutorial for you, but I'd love it if you'd be willing to leave a comment to let me know whether you prefer a picture tutorial, or a video tutorial. The reason this card took me so long to finalize is not because the idea was complicated--it certainly isn't. I was working hard to use as few supplies as I could, so you could recreate this card without spending a fortune :-) I only used one ink pad, the Island Indigo Classic Stampin' Pad. All the images come from one stamp set, the Christmas Tagables photopolymer stamp set. The background was created with 4 stamps from this set, that I adhered in a line, on Clear Block I, so I could ink them up and stamp them across the card a whole line at a time. 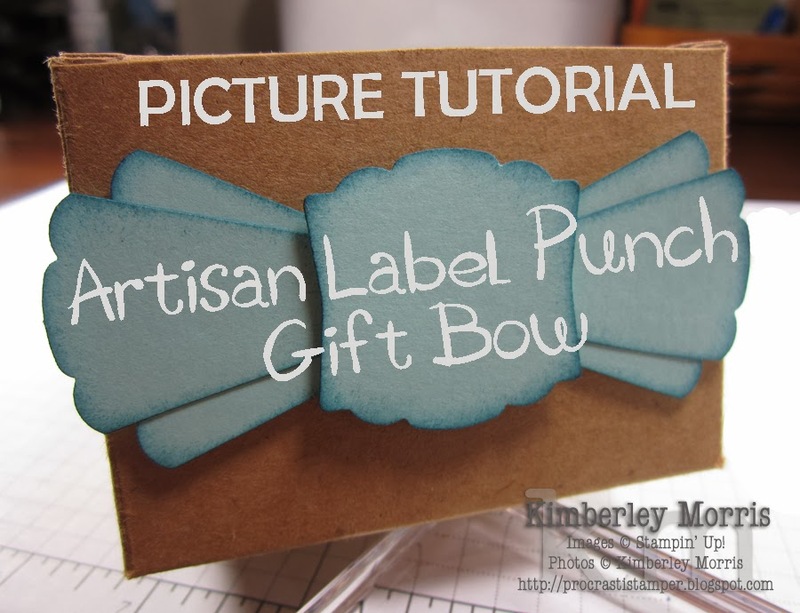 The bow was created using only the Artisan Label Punch, which happens to coordinate with the Christmas Tagables stamp set. I used the Winter Frost Designer Series Paper Stack for the bow center, and to wrap around each chocolate. The rest of the colors coordinate with the paper stack: Smoky Slate card stock, Island Indigo card stock, and Pool Party card stock (which I used for the bow ends, although you could use the Pool Party patterned paper from the stack if you prefer). Other than that, you'll need a Stampin' Sponge if you want to shade the bow, and some Tombow Multipurpose Glue, and just a couple of Stampin' Dimensionals. The Divine chocolates are perfect for keeping this treat card mailable, though you may need to pay for just a little extra postage, and have the Post Office hand cancel this for you. You can choose either the Milk Chocolate Mini Pieces or the Dark Chocolate Mini Pieces, as they are both the same size. You can find them in the Snacks section of the Shop tab on DivineChocolate.com or under the FOOD section at serrv.org (I have no affiliation with either of those sites, and get no referral compensation--I just love their chocolate). This is the last of five cards we made at my last Christmas Card class, this one features the Merry Minis Punch Pack and a saying from the Greetings of the Season stamp set (which you can get in wood-mount or in clear-mount). The colors on this card look quite traditional, but the "red" is actually Raspberry Ripple, the yellow is our Crushed Curry, and the sponging all around the card that seems to emit burgundy tones, is actually a brown--Chocolate Chip. 1) Cut Chocolate Chip card stock to 5-1/2" x 8-1/2" and score in half to create a 4-1/4" x 5-1/2" card base with the fold at the top. 2) Cut Sahara Sand card stock to 5-1/4" x 4", and roll with Chamomile Stampin' Around wheel, inked in VersaMark. 3) Sponge liberally around the edges of the Sahara Sand layer with Stampin' Sponge loaded with Chocolate Chip ink, and adhere this layer to the front of the card base. 4) Punch one Postage Stamp Punch piece from each of these colors of card stock: Garden Green, Raspberry Ripple, and Crushed Curry. 5) Punch one of each Merry Minis Punch Pack shape out of the same scrap piece of Very Vanilla card stock: tree, ornament, and star. Leave plenty of room around each shape, for the next step. 6) Turn over your 1" Square Punch and align the vanilla punched card stock so you can see one of the punched shapes in the center of the square. Punch out the square around the shape, then do this for the remaining two shapes. 7) Sponge lightly around the edges of each punched square with Chocolate Chip ink. 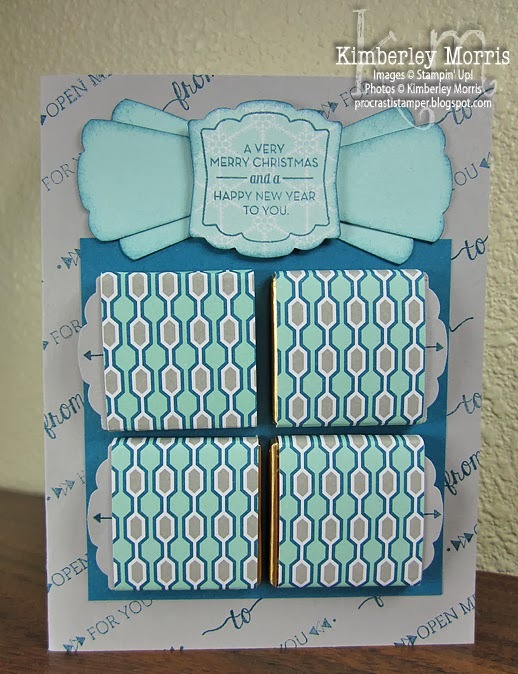 9) Using Mini Glue Dots, adhere the layered punch pieces onto the card front as shown. 10) Apply small self-adhesive Basic Pearls to punched shapes as shown. 11) Stamp 'Merry Christmas' greeting from Greetings of the Season stamp set under layered punch pieces as shown, using Raspberry Ripple ink. You may wish to use the Stamp-a-ma-jig to ensure your greeting gets stamped exactly where you want it. 12) Place card in Very Vanilla Medium Envelope, affix appropriate postage, and mail! You can find all the supplies to make this card in my ONLINE STORE, by searching with the item numbers listed in the Stampin' Supplies below. Please contact me if you need any assistance with the instructions or with your shopping. Stampin' Supplies: Greetings of the Season stamp set (wood-mount 128030 or clear-mount 128033), Chamomile Stampin' Around Wheel 125432 (used with Standard Handle 102971),VersaMark ink pad 102283, Chocolate Chip card stock 102128 and ink pad 126979, Sahara Sand card stock 121043, Garden Green card stock 102584, Raspberry Ripple card stock 126842 and ink pad 126859, Crushed Curry card stock 131199, Merry Minis Punch Pack 126882 (contains 3 small punches: tree, ornament, and star), Postage Stamp Punch 122344, 1" Square Punch 124094, Stampin' Sponges 101610, Basic Pearls 119247, Very Vanilla Medium Envelopes 107300, SNAIL 104332 or Tombow Glue 110755, Stampin' Dimensionals 104430, Mini Glue Dots 103683, Paper Snips 103579, Stampin' Trimmer 126889, Stamp-a-ma-jig 101049 (optional, but recommended). 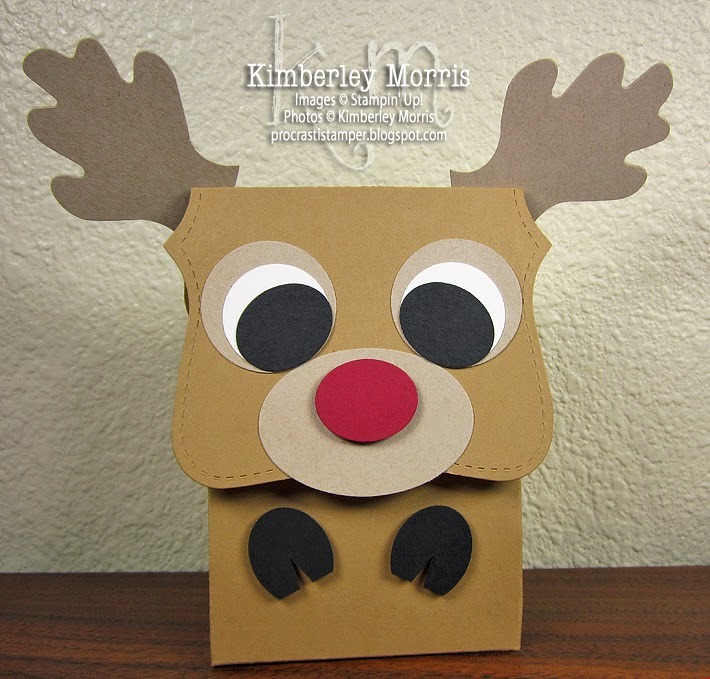 Festive Flurry Ornaments Kit - While Supplies Last! Use your 3D snowflakes to top presents, embellish cards, create a wintery garland, or even trim the tree. How you use them is up to you! You can make these ornaments using basic Stampin' Up! supplies, but to get everything you'd need, you could easily spend over $100. Make it easy on yourself, and your budget, and just buy the kit!!! This is the fourth of five cards we made a little over a week ago at my Christmas Card class, this one features the Daydream Medallions stamp set (which you can get in wood-mount or in clear-mount), and coordinating Floral Frames Framelits. I have seen many iterations of this two-layer wreath since the release of the stamp set and framelits, but my version uses a little trick that can help you cut down on the amount of supplies you'll need. Namely, I use only the Floral Frames framelits set to cut the wreaths...no other die cutting or punch tools are necessary. 1) Cut Real Red card stock to 5-1/2" x 8-1/2", then score in half to create 4-1/4" x 5-1/2" card base with fold at left. 2) Cut Whisper White card stock to 5-1/4" x 4", and run through Big Shot in Framed Tulips Embossing Folder. 3) Stamp largest Daydream Medallions image onto Gumball Green card stock, using either Gumball Green ink (as shown in sample), or VersaMark ink. 4) Cut this image out with second from largest Floral Frames framelit, while also cutting a hole in the center of the image using the fourth from largest Floral Frames framelit. The Magnetic Platform is the most convenient way to hold both framelits securely in place while you run this piece through the Big Shot one time. 5) Stamp second to largest Daydream Medallions image as described in step 3. 6) Die cut this image as described in step 4, only use the third from largest Floral Frames framelit for the outside, and the smallest Floral Frames framelit for the center. 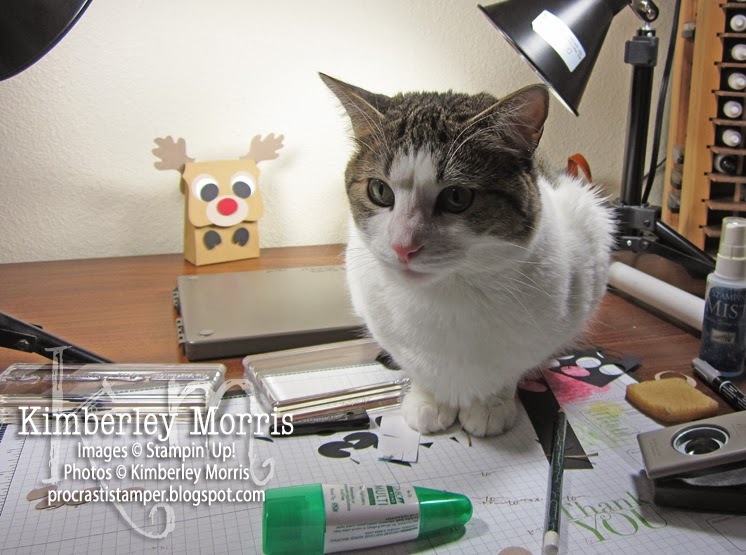 7) Adhere the Whisper White tulip frame embossed layer to the card base front with SNAIL or Tombow Liquid Glue. 8) Adhere largest Gumball Green wreath piece to upper portion of framed layer, using SNAIL or Tombow Liquid Glue. Ensure points of piece are oriented as shown on sample, for best fit. 9) Stamp "Merry Christmas" greeting in Real Red ink, at bottom of card. 10) Adhere smaller wreath piece on top of larger one, using Stampin' Dimensionals. You may want to diverge from the sample here, and orient the "valleys" around the smaller flower to alternate with those on the bigger flower--it sets off the wreath a bit better. 12) Tie a 6" length of Real Red 1/8" Taffeta Ribbon in a bow, trim off ends and adhere to smaller wreath piece with a Mini Glue Dot. 13) You may choose to cut another 5-1/4" x 4" piece of Whisper White card stock to place inside the card, for writing or stamping a greeting. 14) Put your card in a Whisper White Medium Envelope, affix appropriate postage, and mail your card! You can find all the supplies to make this card in my ONLINE STORE, by searching with the item numbers listed in the Stampin' Supplies below. Please contact me if you need any assistance with the instructions or with your shopping. 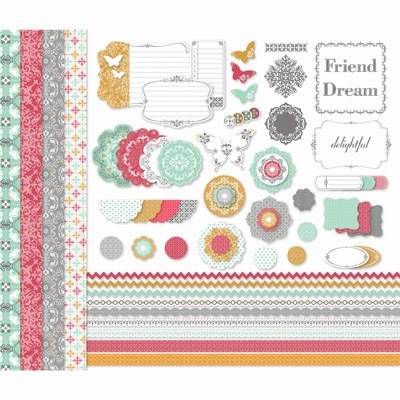 TIP: When you choose the clear-mount version of the Daydream Medallions stamp set, you get several large die cut rubber "dots" and "rings" you can also mount on clear blocks to make quick and easy stamped backgrounds! Stampin' Supplies: Daydream Medallions stamp set (wood-mount 131976 or clear-mount 126467 with Clear Block E 118484 and Clear Block F 118483), Teeny Tiny Wishes stamp set (wood-mount 128478 or clear-mount 127802), Real Red card stock 102482 and ink pad 126949 (or Marker 100052), Gumball Green card stock 126840 and ink pad 126821 (or VersaMark ink pad 102283), Whisper White card stock 100730, Big Shot 113439, Floral Frames Framelits 127012, Magnetic Platform 130658, Framed Tulips Embossing Folder 121809, Real Red 1/8" Taffeta Ribbon 119251, Basic Rhinestones 119246, Whisper White Medium Envelopes 107301, SNAIL 104332 or Tombow Glue 110755, Mini Glue Dots 103683, Stampin' Dimensionals 104430, Paper Snips 103579, Stampin' Trimmer 126889. 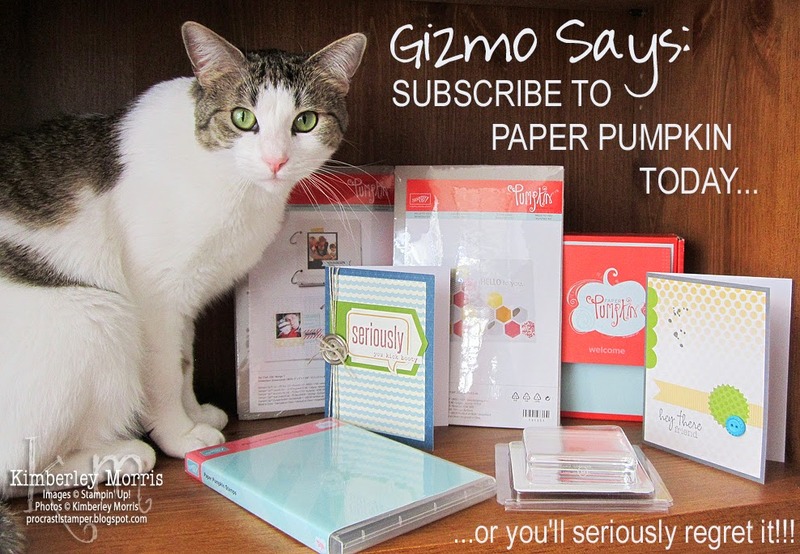 Click HERE to view FAQs about Paper Pumpkin, or to sign up! Current Paper Pumpkin Subscribers: Remember to sign in and manage your account HERE by 11:59pm MT on November 10th, if you would like the changes to take place this month. You can Skip, Change the Quantity of kits you receive, update your payment and/or shipping information, or Cancel. This is the third of five cards we made last weekend at my Christmas Card class, featuring the Be Merry single stamp. Stampin' Up! is offering several individual holiday stamps through January 31, 2014. Click to see ALL of the 2013 Single Holiday Stamps, as well as ordering details (including clear block sizes and coordinating dies and punches). 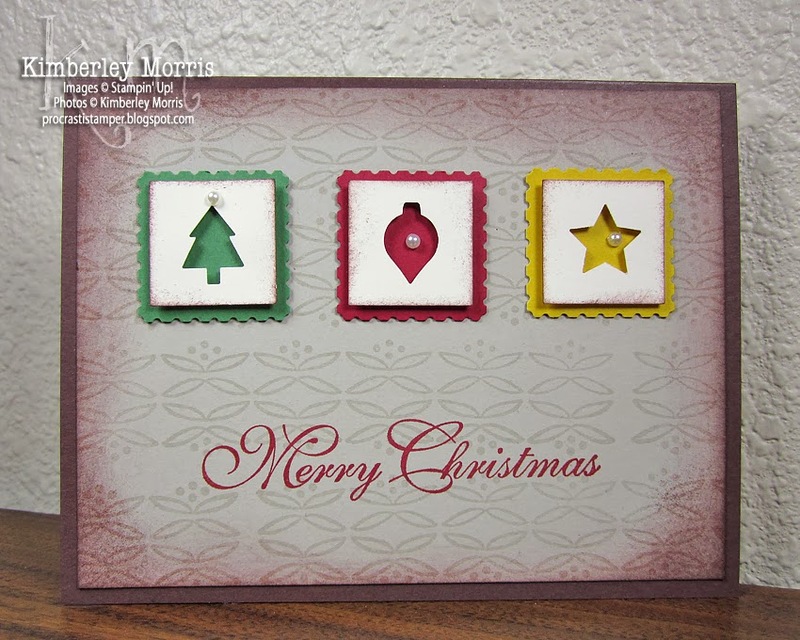 You may also want to see my post on how to turn the Be Merry stamp into 3 separate stamps, HERE. 1) Cut Cherry Cobbler card stock to 5-1/2" x 8-1/2", then score to create a 4-1/4" x 5-1/2" foldover card base, with the fold at the top. 2) Cut Sahara Sand card stock to 5-1/4" x 4", and place in Square Lattice Embossing Folder, then run through Big Shot. 3) Remove or omit the "to" and "from" lines from the Be Merry stamp, and ink up in Cherry Cobbler. Stamp once on Sahara Sand card, then reink and stamp again on Whisper White card stock. 4) Hand trim out the Sahara Sand Be Merry image, just outside the border lines. 5) Die cut the Whisper White Be Merry image with the tag from the Chalk Talk Framelits, using Magnetic Platform with the Big Shot. Be sure you are die cutting just the center of the image, and excluding all the border lines from the image. 6) Using the fine writing point of an Old Olive marker, carefully add color to the leaves on the Whisper White Be Merry tag. To avoid any color bleeding, try not to color over the Cherry Cobbler ink lines. 7) Place an arrow clip from the Essentials Hardware Clips assortment at the top right slanted corner of the Whisper White Be Merry tag. 8) Cut at least 18" of Cherry Cobbler Baker's Twine, and tie a double bow around the arrow part of the clip. (Tie a regular bow and pull tight to the size you want, then, using the tails, make another right on top of that. Adjust to desired size and trim ends.) If you can't get the double bow to look the way you want, consider folding your 18" length of twine in half to create two layers, and tie a single bow. The double bow is much less bulky, and may save you from having to affix extra postage. 9) Adhere the Whisper White tag on top of the Sahara Sand tag with Stampin' Dimensionals and set aside. 10) Adhere the 5-1/4" x 4" embossed Sahara Sand layer onto the front of the Cherry Cobbler card base, using Tombow Glue or Mini Glue Dots. 11) Affix 3 strips of Season of Style Washi Tape across the lower front of the card base as shown. Be sure to place the red, then the green, then finally place the sand colored washi tape on top, so it can be seen. 12) Adhere the layered tag to the card front, over the washi tape, using Mini Glue Dots. 13) Stamp the Be Merry image in Cherry Cobbler ink, over the back closed flap of a Whisper White Medium envelope, if desired. 14) Affix appropriate postage, and mail your card! Stampin' Supplies: Be Merry single stamp 134767, Clear Block E 118484, Cherry Cobbler card stock 119685 and ink pad 126966 (or Marker 119681), Sahara Sand card stock 121043, Whisper White card stock 100730, Big Shot 113439, Square Lattice Embossing Folder 119976, Chalk Talk Framelits 129983, Magnetic Platform 130658, Old Olive Marker 100079, Essentials Hardware Clips Assortment 129964, Cherry Cobbler Baker's Twine 123125, Season of Style Designer Washi Tape 132155, Whisper White Medium Envelopes 107301, Tombow Glue 110755, Mini Glue Dots 103683, Stampin' Dimensionals 104430, Paper Snips 103579, Stampin' Trimmer 126889. 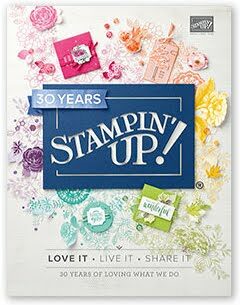 Today is the FINAL DAY of Stampin' Up! 's Digital Scrapbooking Days at MyDigitalStudio.net! Just in case you missed any of these Daily Deals, Stampin' Up! is offering ALL 8 DAILY DEAL Downloads at 50% OFF - TODAY ONLY until 11:59pm MT tonight (Nov 8th). 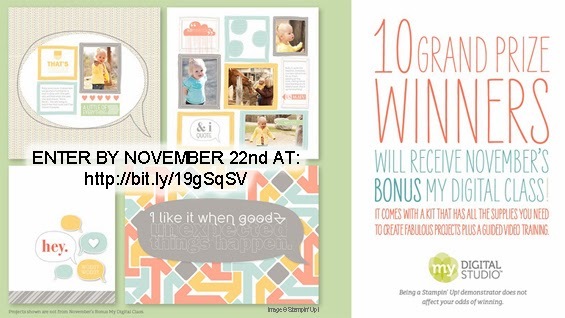 COMING SOON: Starting November 12th and going through November 22nd, you will be able to enter a contest to WIN A FREE MY DIGITAL CLASS from Stampin' Up! These NEW classes will feature exclusive digital downloads, and walk you through creating projects from start to finish! You may want to Subscribe to My Blog by Email so you can get updates and reminders sent right to your email Inbox. November 1st: Amped Up Ampersands Kit Contest Tag: "Ampersands"
November 2nd: Hello There Kit Contest Tag: "Hello There"
November 3rd: All Time Fave Photobook Template Contest Tag: "All Time Fave"
November 4th: Modern Medley Overlays Kit Contest Tag: "Modern Medley"
November 5th: Be Brave Pocket Cards Contest Tag: "Be Brave"
November 6th: Nobody's Business Photobook Template Contest Tag: "Nobody's Business"
November 7th: Autumn Traditions Kit Contest Tag: "Autumn Traditions"
November 8th: Afternoon Daydream Kit Contest Tag: "Afternoon Daydream"
Browse all available digital downloads HERE. Download and print out my FREE Digital Downloads List PDF to keep track of your purchases. Do you have an iPad or Android Tablet? If you do, you might want to download the My Library for My Digital Studio app to keep track of your purchases with a visual catalog!